In July, we interviewed developer and history lover Dan Vanderkam about OldSF, an interactive map he created of San Francisco Public Library photographs taken between 1800s and the 1970s. We at Ready State decided to take OldSF for a spin around the North Beach neighborhood of our San Francisco office to see what the places tagged in the photos look like now. All new pictures were taken in December 2015. Left: Construction on Union Street near Stockton Street, October 1924. Right: Union Street today. Just down the street from our office is the exact spot where the 1924 photo was taken. The changes are subtle but interesting: There are now cars, streetlamps, and a token effort at urban greening; the telephone wires have presumably moved underground. Left: Rossi’s Market at the corner of Vallejo Street and Columbus Avenue, January 1955. Right: Piazza Market today. After 60 years in business, Rossi’s closed in 2003. Piazza Market, which opened in 2008, is now closed. Mama’s, the popular brunch spot on Washington Square, is working on opening a second restaurant and community market within the building. We’re guessing that there weren’t a lot of bicycles on the streets in the 1950s, or, if there were, the city didn’t feel a need to warn drivers about them. The antique truck in this photo is just a coincidence. Left: Columbus Avenue at Broadway, October 1973. Right: Columbus Avenue at Grant, looking toward Broadway today. The skyline is busier than it was four decades ago, with more buildings filling it. Left: Columbus Avenue near Powell Street, 1940. Right: Columbus Avenue at Filbert, looking toward Powell Street, today. The intersection has changed a lot, so much so that we’ve stared at the first photo for a really long time to convince ourselves that we’re in the right spot. The cable car tracks are gone. The Transamerica Pyramid is up. The trees are different, and there are now traffic lights. It looks like a totally different city. 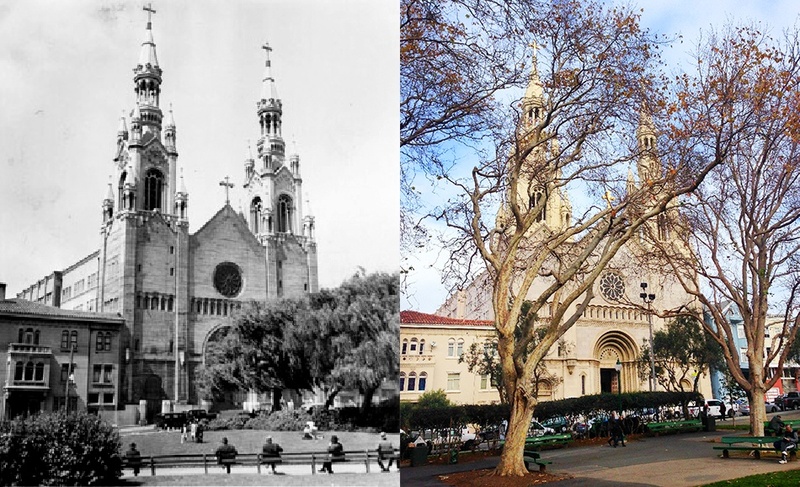 Left: Saints Peter and Paul Church, July 1939. Right: Saints Peter and Paul Church today. Known as “The Italian Cathedral of the West,” anarchists tried five times to bomb the church while it was under construction between 1926 to 1927, according to Wikipedia. Left: Washington Square, July 1862. Right: Washington Square Park with Coit Tower today. San Francisco’s first mayor, John W. Geary, declared this a public square in 1850. Eventually, an unpaved X formed in the grass, as people sought the fastest way to get from Union Street to Filbert Street by foot or on horseback. More or less everything has changed over the last century and a half. Coit Tower, which now tops the hill in the background, wouldn’t be built for another 70 years. Left: Broadway and Stockton streets, 1889. Right: The middle of Chinatown. More than 28,000 buildings in San Francisco were destroyed in the 1906 earthquake. Presumably, the ones at Broadway and Stockton were among them. Evidently, people read books and talked to one another in the 1970s. 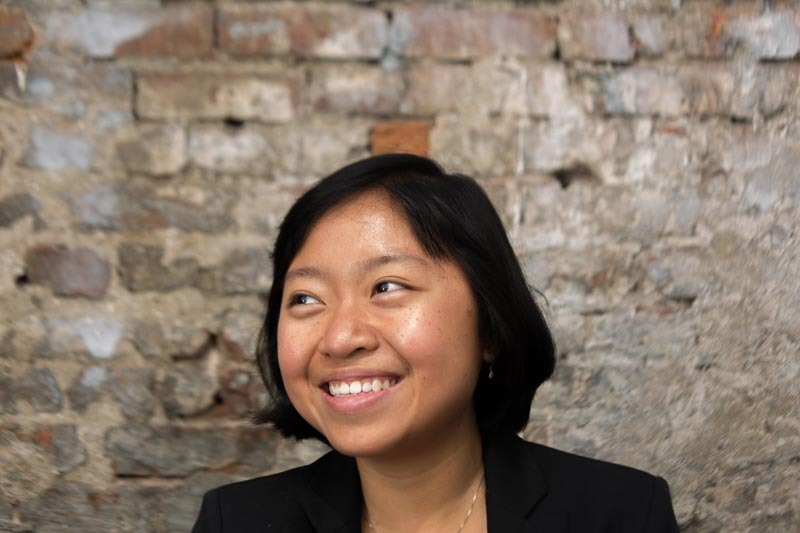 Ready State reporter Pearly grew up in Singapore. She began playing the piano at age 2 and performing at 4. Today she plays the tenor ukulele and violin. She decided to study journalism, at Nanyang Technological University in Singapore and then the University of California at Berkeley, to ultimately make a career of learning from people worldwide. She believes that writing should make people feel; it is only when we feel that we consider, think, and change.